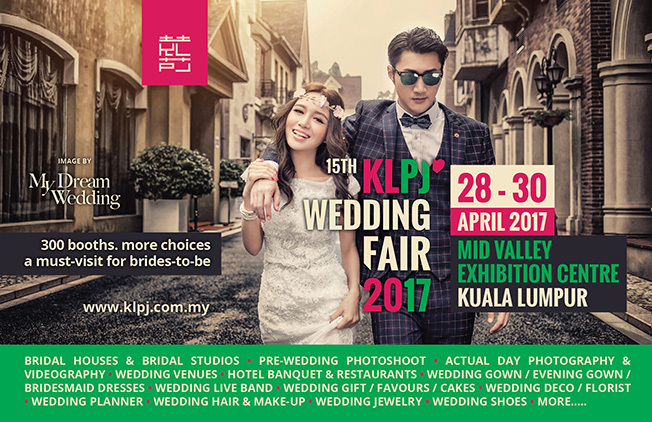 15th KLPJ Wedding Fair 2017 on 28, 29 & 30 April 2017 at Mid Valley Exhibition Centre, Kuala Lumpur is the premier wedding expo in Malaysia. Featuring the most trendy and the latest pre-wedding photography concept inspired from around the globe, specifically custom-made to cater to the current generation’s needs and demands. Presented to you through various Award Winning Top Bridal Houses from PJ SS2, Damansara & Kuala Lumpur. The only bridal fair in 2017 to incorporate more than 100 Hotels & Restaurants for your wedding dinner in Malaysia. Plan your dream wedding within your budget or in the most luxurious 5-star hotel banquets. Search your preferred and available wedding date all under one roof at Mid Valley Exhibition Centre from various participating Wedding Banquet Venues in Klang Valley, Selangor, Penang or Johor. Introducing our very first "Fashion @ KLPJ", featuring a classy yet casual exhibition you never encounter before. Source everything you need here from Malaysia's Best Wedding Suppliers - Wedding Gown, Wedding Dress, Wedding Shoes, Wedding Jewellery, Wedding Live Band, Wedding Planner, Wedding Decoration, Florists, Bridal Make-up, Photobooth, etc.